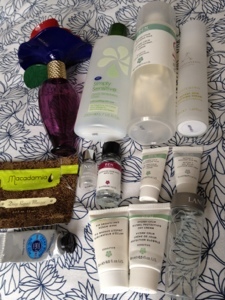 I've been making a real effort to finish off products this month - hopefully something you can see by all the empties! Marc Jacobs Lola perfume - this is one of my favourite scents. My boyfriend bought me a new bottle for Christmas so have already re-bought! Boots Simply Sensitive toner - this is my standard daily toner and I probably get through a bottle a month. It's such a bargain for under £3 and does the job perfectly. 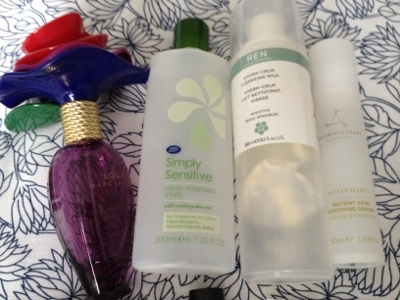 REN Hydracalm Cleansing Milk (full size and mini sample) - again, my regular cleanser that I always replace. 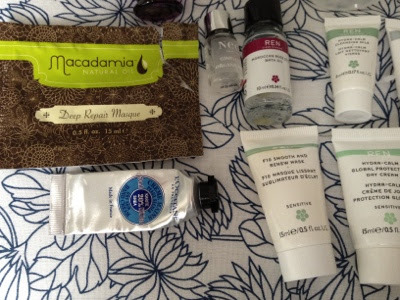 I used up the tiny travel size as I was waiting on my new bottle to be delivered. Aromatherapy Associates skin soothing serum - this was an expensive impulse purchase that I made back in September. I was loving using it, and was a bit worried when it ran out as at £42, I wasn't able to replace it at the time. however, I really haven't noticed any difference in my skin since I stopped using it, so perhaps it wasn't doing as much as I thought! Macadmia intensive hair masque - love this! Will definitely be buying a full size post spending ban. Full review here. Neom complete bliss bath oil and REN Moroccan Rose bath oil - both of these smell like rose Turkish Delight (divine in my opinion!). I have another of the REN oil as part of a gift set, but once that's used up, I would definitely buy either of these again. REN Active 7 eye gel sample size - this is a really light, hydrating gel that I used in the mornings under my eyes. I prefer a cream, so probably won't buy. L'Occitaine hand cream mini - one from my Latest in Beauty Advent Calendar, this was the perfect size for my handbag. I have a few more knocking around in different scents so no need to buy more at the minute! REN F10 face mask - I really love using this orange scented face mask. It's gentle on skin and leaves it feeling lovely and soft. Once I've used up some more of my stash, I'm going to re-buy a full size pot. REN Hydracalm day cream - this is my daily morning moisturiser. I have a few more minis of this to use up but once they're gone, I'll be rebuying. Lancome Bi Facil eye makeup remover - I used to love this product, but have gone back to more creamy removers of late as I find that they do a better job of removing stubborn mascara. This one is also quite expensive (£21 full size) so I won't be re-buying. Even though you have got through some minis you have still finished quite a few items which is great! I am doing no where as good as you when it comes to finishing things! It seems to take me AGES! I think i just had a good month ;) am on a mission not to buy any more products! Oh wow, loads of skincare! Good job!